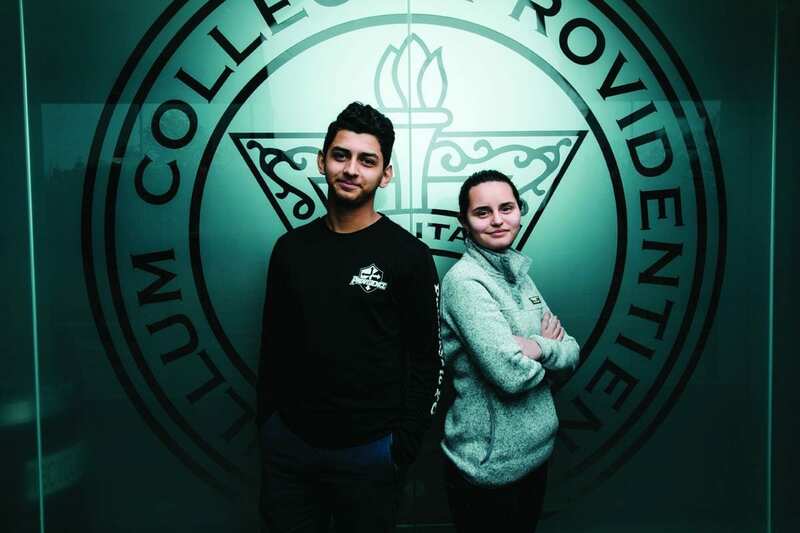 Our Moment: The Next Century Campaign for Providence College enabled and catalyzed new buildings, new academic programming, and new ways to engage the College’s Catholic and Dominican tradition. It has changed the PC experience forever, and for the better. Today’s students learn and live in a diverse community that affords them extraordinary opportunities to thrive. They will graduate prepared and inspired, products of an ascendant institution durably grounded in core ideals that unite the members of its family, both past and present. Emma Burgess ’18, an applied physics major, and Bianca Saliba ’18, a chemistry major, are the first Clare Boothe Luce Scholars at PC, selected based on their academic standing, commitment to the sciences, and interest in pursuing an advanced degree or career in the sciences after graduation. In 2016, the College received a $288,538 four-year award from the Henry Luce Foundation to provide support to the top two female students majoring in chemistry, applied physics, mathematics, or computer science. 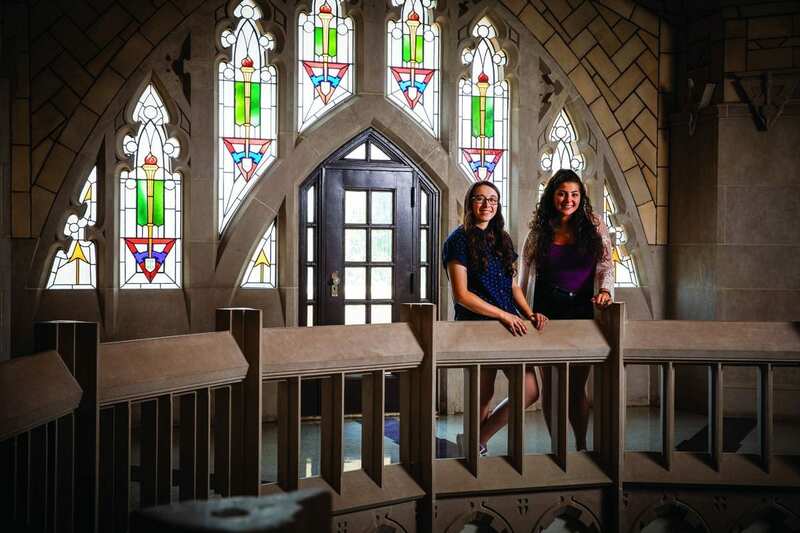 Burgess and Saliba received free tuition scholarships for their senior year, $4,000 for summer research with a faculty member, academic credit for research during the school year, and the chance to plan a project to encourage young women to study science. Burgess, who is from Huntsville, Ala., works with Dr. Seth T. Ashman, assistant professor of physics, on computational and experimental projects. She will plan a science project with young girls through the Providence After School Alliance and wants to attend graduate school. Saliba, who is from Johnston, R.I., works with Dr. Seann P. Mulcahy, associate professor of chemistry, on beta-Carbolines, compounds which bind to DNA and protein receptors in the brain. For her service project, she will return to her all-girl high school, St. Mary Academy – Bay View in East Providence, to lead juniors in a lab experiment. She wants to be a chemist in the cosmetics industry. “Science needs different perspectives and creativity, and women have that just as much as men,” said Burgess. 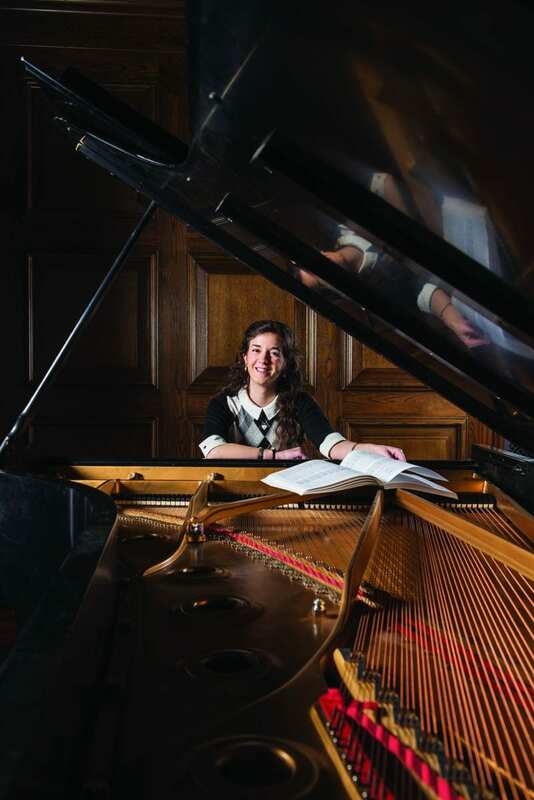 Joan Miller ’18, a music performance and art history double major, was awarded $4,000 from PC’s Veritas Research Fund to analyze the impact of Russian Orthodox chant on the compositions of Igor Stravinsky. Two anonymous benefactors endowed the fund, and its companion Veritas Distinguished Internship Fund, with a $1 million commitment. These funds provide support to several students each summer for independent research and career exploration, as well as stipends to their faculty mentors. Miller, from Oakdale, Conn., visited music archives at Brown University, the Boston Symphony Orchestra, Yale University, and the Eastman School of Music in Rochester, N.Y. In a Cooperstown café, she interviewed Nicholas Kotar, a musician, translator, fantasy author, and Russian hymnographer. He helped her understand the discordant notes in two Stravinsky compositions, Symphony of Psalms and Mass, which she sang with a chorus in high school. Miller chose PC because of the level of individuality she knew she could attain, both in working with professors and on her own. Dr. T.J. Harper, associate professor of music and director of choral activities and music education, is teaching her conducting. At a national conference of the American Choral Directors Association, she discovered that the same score study techniques she learned during her Stravinsky research are valuable assets in conducting, too. “Everything has come full circle,” said Miller, who has prepared pieces to conduct and perform with a student choir. She plans to study choral conducting after graduation. 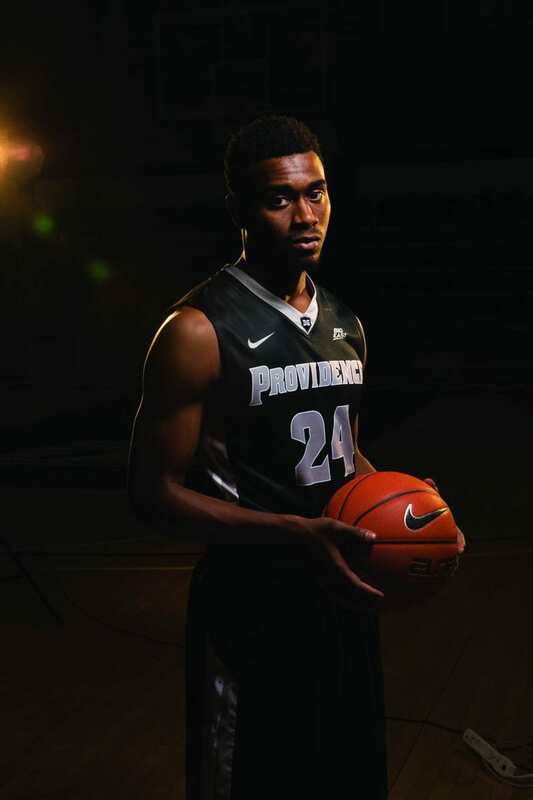 Kyron Cartwright ’18 is a member of the men’s basketball team. As point guard for the men’s basketball team, Kyron Cartwright ’18 is used to being the subject of a camera. Thanks to his new major at Providence College, he may find himself behind one, too. Cartwright is pursuing an individualized major in sports media. It was approved during his sophomore year by a faculty committee led by Rev. Mark Nowel, O.P., dean of undergraduate and graduate studies, after months of research and a presentation. Cartwright must fulfill requirements in public speaking, film, and writing, and complete two internships. Cartwright has always loved history and considered it as a major. But in film class in high school in Compton, Calif., he wrote a 25-page script and turned it into a short video — a project he enjoyed. During his first year at PC, as a student worker in Athletic Media Relations, he began to consider a career as a sports broadcaster. During the summer of 2016, Cartwright interned at WLNE-TV, Channel 6, in Providence, shadowing the sports director and reporter during trips to Gillette Stadium and McCoy Stadium. Marissa Mezzanotte, academic coordinator for men’s basketball, credits Cartwright with planning for a future beyond basketball. “He takes a lot of pride in his academics,” said Mezzanotte. “He’s thinking about his career when a lot of people are still really thinking about basketball. He embodies the idea of a student-athlete: thinking about his academics and career while excelling on the court. 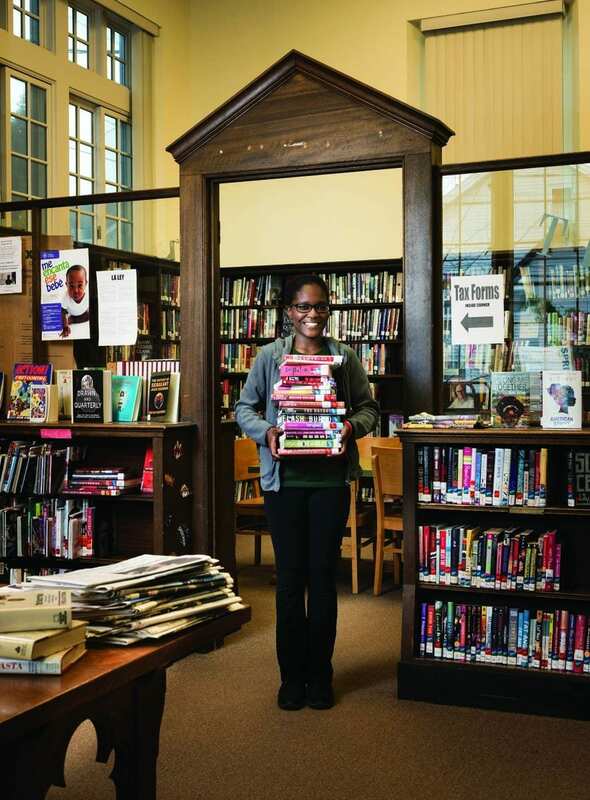 During her sophomore year, three times a week, Phoebee Jean ’19 met the school buses that pulled up to the Smith Hill Library a few blocks from PC’s campus. She greeted the elementary and middle school children, helped them with homework and book selection, and talked to them about their days. Jean was paid for her library work through federal work-study funds she was awarded as part of her financial aid package at PC. But she took the role a step further, serving as a community liaison and mentor for other PC students who visit the library to observe through the Feinstein Institute for Public Service. Her dedication to community work, her role in student organizations such as the Society Organized Against Racism, and a spring break trip to Tijuana to explore issues of borders and immigration led to Jean’s selection as a Newman Civic Fellow for 2017-18. She enjoyed networking events in the state, mentoring, and learning more about social change. Now Jean is learning more about the world. She is spending the Spring 2018 semester studying in Vietnam, South Africa, and Argentina. She is learning how communities understand and strive for health and well-being through a program called Health and Community: Globalization, Culture, and Care, offered by the International Honors Program. To make her travel possible, Jean was awarded a competitive $5,000 Benjamin A. Gilman International Scholarship, funded by the U.S. Department of State and administered by the Institute of International Education. U.S. Pell Grant recipients are eligible to apply for the scholarship, which gives priority to students from diverse backgrounds who are studying around the world, especially in non-traditional destinations. 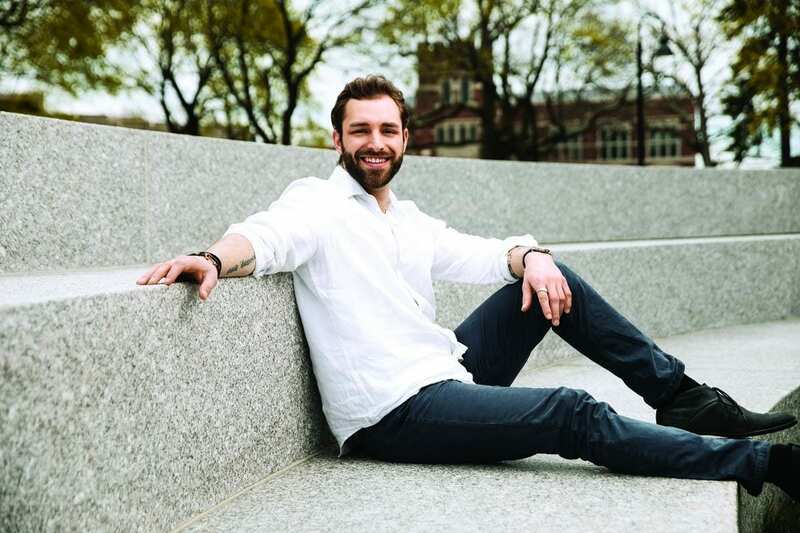 Andrew Konnerth ’17 was president of Student Congress and active in many organizations and social causes. The tattoo on the right forearm of Andrew Konnerth ’17 reads: “Think Dangerously.” It was inspired by a high school history teacher, but it applied to his college experience as well. Konnerth received a merit scholarship to attend PC. He majored in both political science and public and community service studies, was active in student organizations, and studied abroad. He was president of Student Congress and helped run Friar Food Rescue, an organization that transports leftover food from the PC dining hall to sites that serve the needy. He spent a semester studying non-western approaches to human rights issues in Nepal, Jordan, and Chile. He now is an AmeriCorps VISTA member at the Social Enterprise Greenhouse in downtown Providence, helping social entrepreneurs launch their businesses. His time at PC strengthened his desire to learn more about how to effect change. 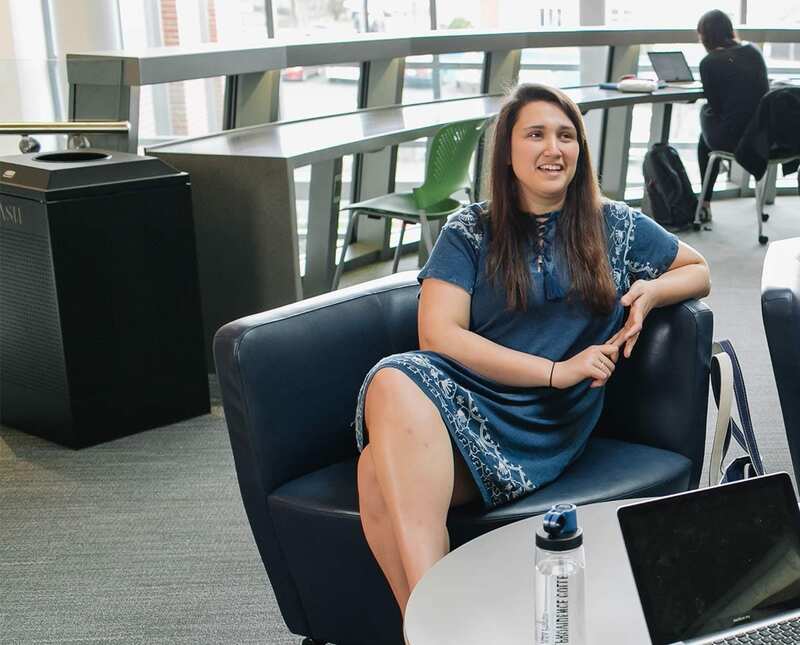 For Kristina Lynch ’18, a double major in finance and management, the opening of the Arthur F. and Patricia Ryan Center for Business Studies as the home of the School of Business was a monumental change. “It’s created an atmosphere like no other. It’s home,” said Lynch. As president of Future Friar Executives, a liaison for all business clubs, Lynch plans the Involvement Fair and works to increase community service opportunities for students. She organizes the annual Barbecue Bash, which brings food trucks to campus for students and faculty and their families, and she is an advising mentor for first-year students. As she prepares to enter the job market, Lynch is grateful that the business school offers so many special topic courses and preparation courses for professional certification exams. “Students from other schools are shocked that we have these opportunities here,” said Lynch, who is from Bristol, R.I.
A paid intern at BankNewport during the summer, she will explore the commercial side of lending after graduation. 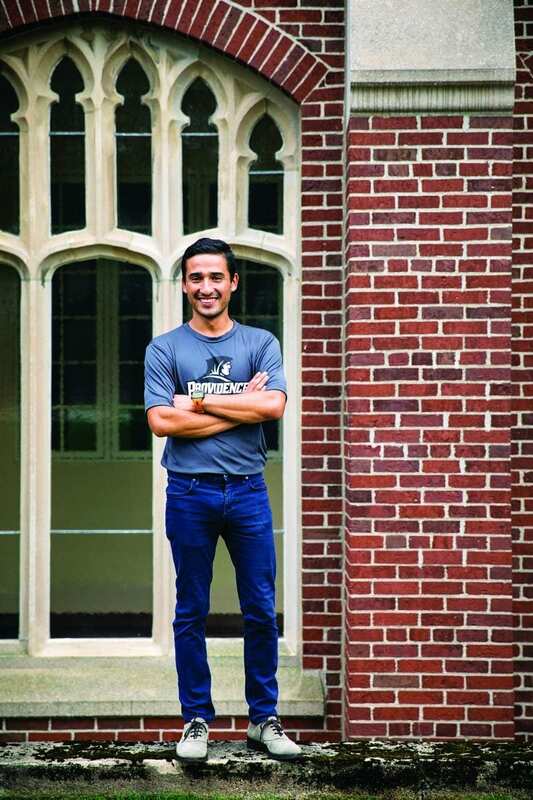 Heriberto Castro ’18 was one of the first students to take part in Friar Foundations, a five-week summer bridge program designed to introduce new students to academic and campus life. Three years later, as a senior, Castro served as a program mentor, sharing what he’s learned and encouraging first-year students to take advantage of the College’s resources. The Development of Western Civilization Program attracted Castro to PC. Its classes, a mixture of English, history, philosophy, and theology, were among his favorites. Friar Foundations — which has received support from The Angell Foundation, founded by the late David ’69 & ’94Hon. and Lynn Angell, and the Salah Foundation — introduced Castro to resources in the Office of Academic Services, including the Writing Center and the Tutoring Center. He found so many courses interesting, including anthropology and sociology, that he had trouble choosing a major. Sebastian Saldivar ’17 and Shanley Chandler ’17 helped provide new students with school supplies and residence hall items. Microwaves. Refrigerators. Fans. Storage crates. Bed risers. Every spring, students moving home at the end of the academic year would leave behind the items they no longer needed — or simply throw them away. Now, thanks to a student organization, Lightening Others’ Loads, the items are collected during finals week, stored for the summer, and distributed in the fall to students who need them. The program is a collaboration of Campus Ministry, the Office of Admission, and the Office of Residence Life. Last year, Shanley Chandler ’17, a history major from Damariscotta, Maine, who minored in classics and literature, and Sebastian Saldivar ’17, a psychology major from Princeton, N.J., encouraged students to donate unwanted items, packaged them in time for Move-In Day, and delivered them with hand-written notes of welcome to about 70 first-year students. They even made multiple trips with refrigerators and microwaves to the highest floors of McVinney Hall. The program was founded two years ago by Ramona Batista ’16, who realized the need after moving into her residence hall from Chicago. This year, it is run by Emely Reyes ’18, a psychology major from New York, N.Y.
Shantal Solomon ’17 traveled to Trinidad and Tobago with a Fr. Philip A. Smith, O.P. Fellowship for Study and Service Abroad. 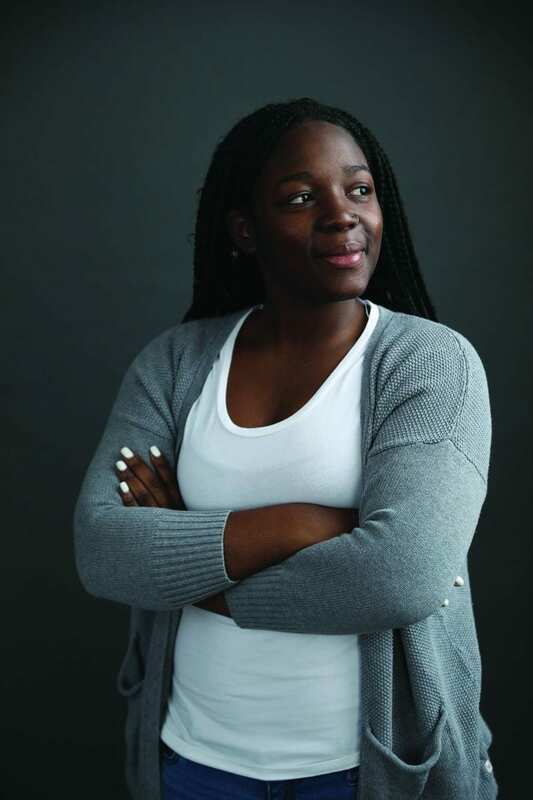 Shantal Solomon ’17 discovered her life’s passion at Providence College: to become a pediatric psychiatrist and work in inner-city neighbor-hoods, like Mission Hill in Boston where she grew up, to remove the stigma associated with mental illness. She pursued a rigorous academic program, majoring in both biology and psychology with a minor in neuroscience, and enhanced her study with volunteer experiences abroad. First was a Campus Ministry trip to Jamaica to work with mentally and physically disabled children and pregnant teens through Mustard Seed Communities. Then she applied for a Fr. Philip A. Smith, O.P. Fellowship for Study and Service Abroad. With nearly $350,000 in gifts from individuals during the Our Moment campaign, this program introduces students to service work by Dominican friars and sisters all over the world. Solomon’s fellowship took her to Trinidad and Tobago to volunteer with the Dominican Sisters of St. Catherine of Siena, who operate an orphanage and youth center for mentally and physically abused children. Solomon, who was a member of the Friars Club, is applying to master’s degree programs to prepare for medical school.